Our Abpromise guarantee covers the use of ab6785 in the following tested applications. Immunomicroscopy Use at an assay dependent concentration. IHC-Fr Use at an assay dependent concentration. PubMed: 15716365For PFA fixed tissue see PMID 15716365. Immunocytochemistry/ Immunofluorescence - Goat Anti-Mouse IgG H&L (FITC) (ab6785)This image is courtesy of an Abreview submitted by J Chai. ab8978 staining vimentin in human colon fibroblasts by ICC/IF (Immunocytochemistry/immunofluorescence). Cells were fixed with methanol, permeabilized with 0.1% Triton X-100 and blocked with Dako serum free protein blocker for 20 minutes at 28°C. Samples were incubated with primary antibody (1/100 in Dako antibody diluent) for 2 hours at 28°C. A FITC-conjugated goat anti-mouse IgG H&L (ab6785) (1/800) was used as the secondary antibody. Ab6785 was used at dilution 1/100 with the primary antibody ab52455 in Flow Cyt. See the review on ab52455. 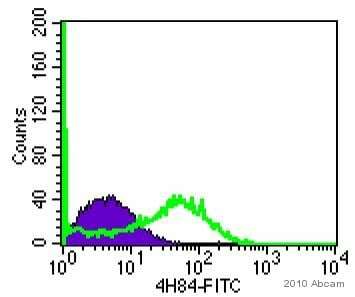 Ab6785 was used at dilution 1/2000 with the primary antibody ab1220 in ICC/IF. See the review on ab1220. Ab6785 was used at dilution 1/300 with the primary antibody ab6002 in IHC-P. See the review on ab6002. Publishing research using ab6785? Please let us know so that we can cite the reference in this datasheet. Can you please send me an MSDS for ab8879 and ab6785? Thank you very much for your call earlier this month and for your patience. I apologize that this took longer than expected, but I hope that this information will be useful. Please let me know if you have any questions and I'll be happy to help. Thank you very much for your call yesterday. As we discussed, we are currently adding several streptavidin-fluorophore conjugates to the catalog and I will let you know as soon as the streptavidin-FITC is ready for sale. I expect this to happen within the next couple of days. Please let me know if you have any questions or if there is anything else that we can do for you. We’ve packaged the other antibody up and are awaiting FedEx pickup. Thanks for sending the correct antibody asap. Thank you for your reply and for returning the vial of ab6785. The vial of ab6717 will be arriving tomorrow on the order ***. Please let me know if you need anything else, and have a wonderful evening. articles, hope will come over the problem. Click here (or use the following: https://www.abcam.com/index.html?datasheet=96881). You will want to check that unstained section to see if the background autofluorescence is a problem in that channel though. Interested in using ab63983 on frozen mouse brain tissue sections. Thank you for your call today and for your questions. Please see below for information about our testing discount program, and let me know if you have any further questions about these antibodies or our IHC protocols. Sinceab63983 has not been tested frozen tissue sections (IHC-Fr), I can offer a discount off a future purchase if you buy ab63983 now, test it inIHC-Fr and submit feedback to us in the form of an Abreview. The discount would be worth 1 free primary antibody. 1. Reply to this e-mail to let me know that you would like to proceed and test ab63983 in IHC-Fr. I will then send a discount code. This code must be issued before purchasing ab63983 so please wait for my reply before ordering. 2. Purchase ab63983 either by phone, fax, or online (www.abcam.com). 3. Test it in IHC-Fr. We are always pleased to obtain feedback about our products and any information is greatly appreciated! Even if ab63983 turns out to be unsuitable for IHC-Fr, you will still receive the discount on your next purchase after your Abreview has been submitted. 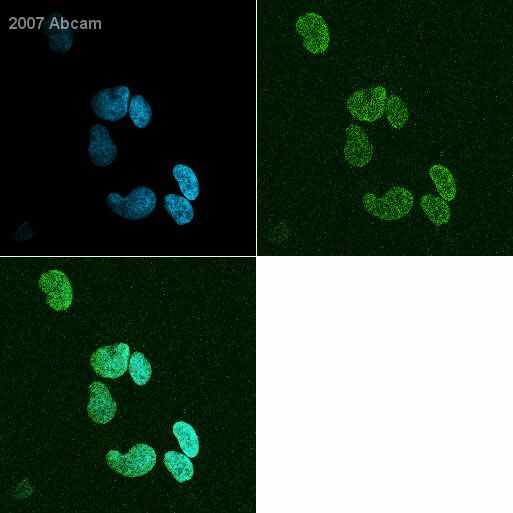 Can Goat polyclonal Secondary Antibody to Mouse IgA - alpha chain (FITC) (ab97234) be used as seondary antibody for "Anti-Francisella tularensis LPS antibody [FB11] (ab2033) in indirect immunofluorescence assay? We would not recommend ab97234 as a secondary for ab2033 because they do not match in isotype. The secondary ab97234 targets Mouse IgA, but the primary ab2033 is IgG2a. I would reccomend using ab6785 Goat polyclonal Secondary Antibody to Mouse IgG - H&L (FITC) instead. Thank you for contacting Abcam. I believe that the staining that you wish to do would work, however by using a mouse primary antibody on mouse tissue, you do run the risk of having high background. I have attached the Abcam protocol for mouse on mouse staining, which will give you information on how to prevent the high background. One popular method is to directly conjugate your primary antibody to a fluorescent tag. We do sell a number of these kits, please see the link below: https://www.abcam.com/easylink If there is anything else I can help you with, please let me know. Thank you for contacting us. The x-ray film may be able to detect fluorescence emission, but the problem is that the FITC would need to be excited with light to emit light, and that would presumably expose all of the film to the excitation light. Luminescence from ECL, on the other hand, is a chemical reaction, and does not require an excitation light. 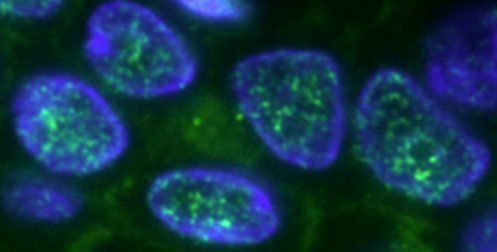 Unfortunately, I think you will need to purchase an HRP-conjugated secondary antibody, unless you have access to a fluorescent detection system. If the secondary antibody ab6785 was purchased within the past week, we will be able to take it back, as long as it is unopened. There will also be a 20% re-stocking fee. Dear Sir/Madam I am writing regarding the product with catalogue number ab6785, We are planning to run a western blotting experiment using ABcam primary antibodies and also using secondary antibody with the cat number ab6785. However we thought this secondary antibody is conjugated with hordish perexidase, however we were surprised to have Diaminotriazinylaminofluorescein conjucated with the secondary antibody. Now we are asking how to detect the fluorescence that emitted from the antibody, can we use the Xray detection (the only detection system that available to us) or do we have to buy a new detection system???? What are the available options for helping us. We really need the answer ASAP. Thank you for contacting Abcam. The product ab6785, the goat polyclonal secondary antibody to mouse IgG - H&L is conjugated with FITC. The only way to detect FITC is with a laser that has the ability to Excite at 494nm and a filter that can detect Emission at 518nm. I do not know of any other way that you can detect FITC. The antibody ab97023, goat polyclonal secondary antibody to mouse IgG - H&L (HRP), would be an appropriate secondary to use with conventional western blot detection systems. If there is anything I can help you with, please let me know. .